For whatever reason, you may want to redact a Gravity Forms field — a fancy way of saying that you don’t want the data that your user enters in that field to be saved to the Gravity Forms entry that gets created when the form is submitted. This is particularly helpful when you have sensitive information that you need to collect and process, but you do *not* want to store it in your database. For example, you need the user to enter a billing address to send it to your payment processor, but afterwards you don’t want to save that information. 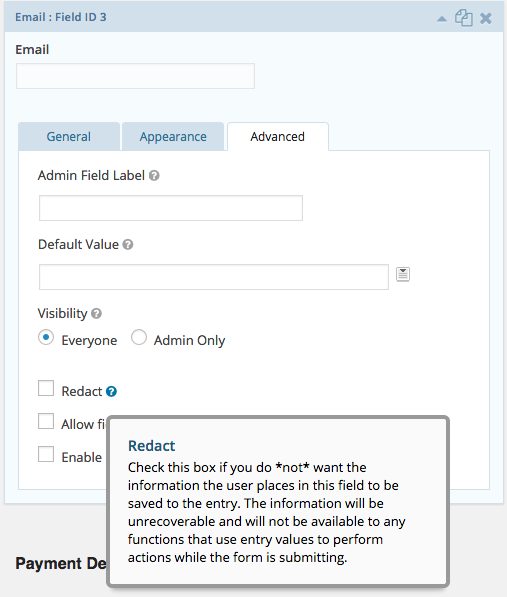 The Gravity Forms Utility plugin adds an option to each form field, allowing you to check a box to redact that field’s data, making sure it never gets saved to the entry. Note that the information is forever unrecoverable — so only use it if you mean it!